A couple of weeks ago, I reviewed a trio of chapbooks from Nightjar Press. Now here’s another set, again reviewed in the order that I read them. Our narrator, Anna, leaves a strongly worded goodbye letter for her husband, then sets out in search of the bar where her lover – referred to only as M – is waiting. She goes into the side entrance of a hotel, and soon finds herself caught up in strange happenings where she clearly doesn’t belong. She is rescued by a young woman named Kristina, who encourages Anna to re-evaluate her life. I have to be honest that I didn’t grasp this story fully. There are some details suggestive of a particular time and place (perhaps Germany, perhaps the early 20th century) which, if correct, would give me some further context for what happens. But then again, the setting often feels timeless. I am left thinking of the hotel as representing the glamour and danger of a life with M, as opposed to the glum misery of Anna’s current life. Her journey then becomes a kinetic way of resolving the dilemma in front of her. I’ve always enjoyed reading Tom Fletcher’s stories; and here is a short, sharp demonstration of why. A man sits in an armchair watching the TV, which shows his wife traversing a blank grey landscape. A caption states that this place is haunted by a predator known as ‘The Home’. The metaphor of creeping old age is plain to see throughout this story; but the strangeness of the scenario only serves to amplify it. The ending has a double impact, from both what happens literally, and what it represents in real life. A woman walks into a local restaurant, sits down at the table, and stays there – for days, weeks, years. She is served meals, and washes in the restroom. Any member of staff who takes against her is promptly sacked. The maître d’ tells the story to one new recruit: the woman had fallen in love with the chef-proprietor; but he was already tied to his restaurant. When the chef and the woman made love, the restaurant caused a small earth tremor in protest. The restaurant would not be left out of its owner’s affections, so the woman stays there to appease it. All of this is told in the most delightfully measured prose, as carefully placed as the elements of a fine restaurant dish. That prose style creates its own world for the story, so that everything within it seems quite logical and natural. By the end, I was reluctant to leave. 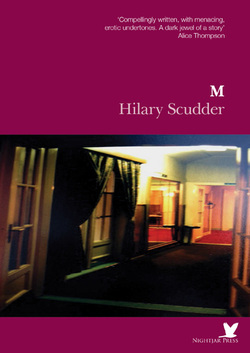 ‘M’ (2013) by Hilary Scudder, Nightjar Press, 12 pages, chapbook (review copy). 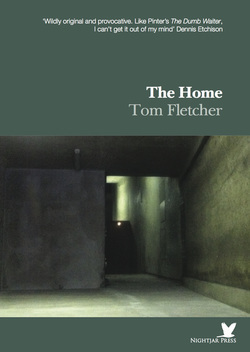 ‘The Home’ (2015) by Tom Fletcher, Nightjar Press, 8 pages, chapbook (review copy). 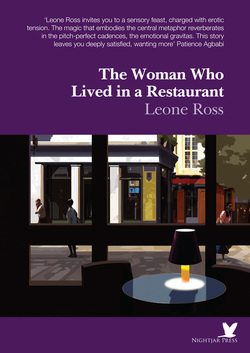 ‘The Woman Who Lived in a Restaurant’ (2015) by Leone Ross, Nightjar Press, 16 pages, chapbook (review copy).